NikeWomen has a new famous face to promote its newest tights. FKA Twigs, the British singer-songwriter-dancer-artist, is the brand’s latest ambassador, the singer and dancer selected to launch the Nike Women Zonal Strength Tights. 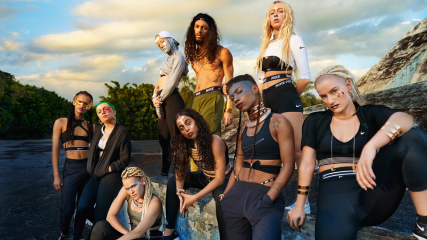 As the Creative Director of NikeWomen’s Spring Zonal Strength Tights campaign, FKA Twigs conceptualized, directed, performed and created the soundtrack for the collection that sheds light on the power of modern movement and defines sport as an important channel of expression. “When Nike first came to me with this project, I saw it as an opportunity to let young people know they have the power to become the best versions of themselves. I put together a cast of 12 incredible athletes to show that it’s about what you do in fitness gear. It’s about how you train. It’s about how those things help your movement,” said Twigs. The cast of athletes includes: karate champion Jay Kirton, dancer Saskia Horton, Olympic fencer Miles Chamley-Watson and Olympic track-and-field star English Gardner for a shoot and accompanying video shot by David Uzochukwu in Mexico City. Nike’s Zonal strength compression tights, available tomorrow, are designed to reduce muscle vibration on the core, glutes, quads and hamstrings. Watch the video below and prepared to be moved.